Two visual artists — one American, the other Turkish — traveled throughout Turkey over 12 years, driven by an image they found everywhere. Their new book, “The State of Ata: The Contested Imagery of Power in Turkey” (Eighteen Publications), is at once a travelogue, oral history, photo album, and meditation on Turkey’s past, present, and future. Mike Mandel and Chantal Zakari, a married couple who both teach at the School of the Museum of Fine Arts in Boston, returned to Zakari’s native Turkey to explore the legacy of Mustafa Kemal Atatürk, founder of the Republic of Turkey and its first president. His image hangs in schools and other public buildings throughout the country and virtually every town has a statue of him. Atatürk, who died in 1938, pushed Turkey to become a modern Western state. The wearing of religious clothing in public was banned, women’s legal rights were expanded, and the Arabic alphabet was dropped in favor of Latin characters. Yet a divide remains. 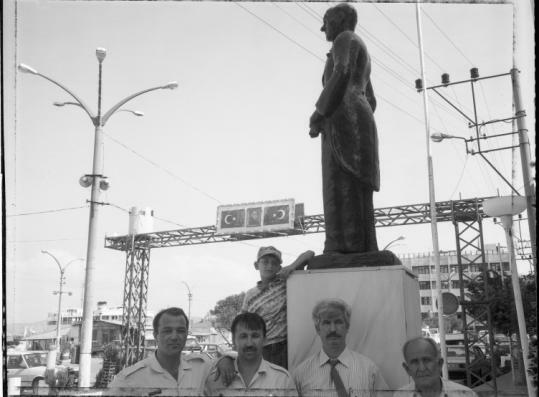 In 1997 when Zakari held up a picture of Atatürk at a march of Islamists as a sign of her support for a secular society, she made front-page news all over Turkey. Mandel writes that some in the religious media accused Zakari of being an agent of the CIA seeking to divide the Turkish people. Others gave Zakari flowers for taking a stand. Gretel Ehrlich is this year’s winner of PEN New England’s Henry David Thoreau Prize for Literary Excellence in Nature Writing. Ehrlich, who has written books about Wyoming, Greenland, and being struck by lightning, will give a talk at 7 p.m. May 6 at 24 Oxford St., Cambridge. When the Archer Home for Elderly People and Chronic Invalids opened in 1907, it was the first business of its kind in New England. Patients turned over their wealth in exchange for lifetime care at the rooming house in Windsor, Conn.
Four years later a reporter for The Hartford Courant became suspicious after he noticed a sharp increase in the number of obituaries for Archer Home residents. In 1916 an investigation brought down one of America’s most prolific serial killers. A serious tone prevails in “The Devil’s Rooming House” (Lyons) by M. William Phelps. After poring over 1,200 pages of trial transcripts, Phelps concludes that Archer-Gilligan remains as much of an enigma today as she was to her contemporaries.